Posted on 29 March 2013, in French Fridays with Dorie and tagged French Fridays with Dorie, spinach. Bookmark the permalink. 14 Comments. You did a great job on the whole plate Betsy! How much it shrinks is ridiculous, I know. Have a good weekend! 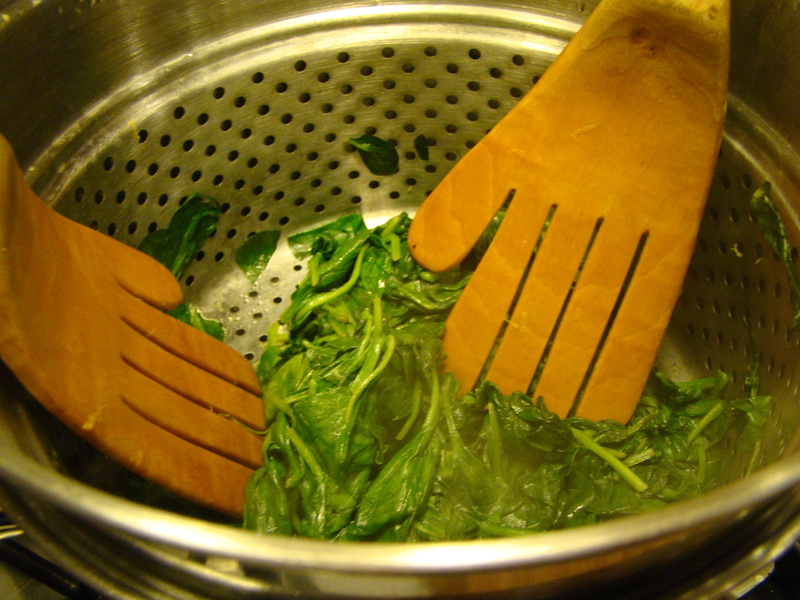 Spinach reduction is CR-AZY – I started with two big puffy bags of spinach and ended up with a couple of handfuls. I hope April works out better for you. I have definitely had some of those months with FFwD (most of January and that month where we did the salmon in a jar – ugh). Hang in there & hope you have a great weekend. It really is amazing how spinach reduces!!! Loved how tasty this was! Have a great weekend. Your whole dinner sounds excellent. It’s making me hungry for lunch….I just tossed my spinach the best I could in my giant steamer, before setting it over the boiling water. It seemed to work fine, and I thought my husband would appreciate having one fewer dish to wash. I agree, the recipes have not been too fab lately, but this was so easy & delicious! Thank you for rescuing our FFWD group & for all the work you do. I’m one of 3 admins for the Baked Sunday Mornings group, so I know how much work & coordination goes into it. Wishing you a wonderful Easter full of blessings! 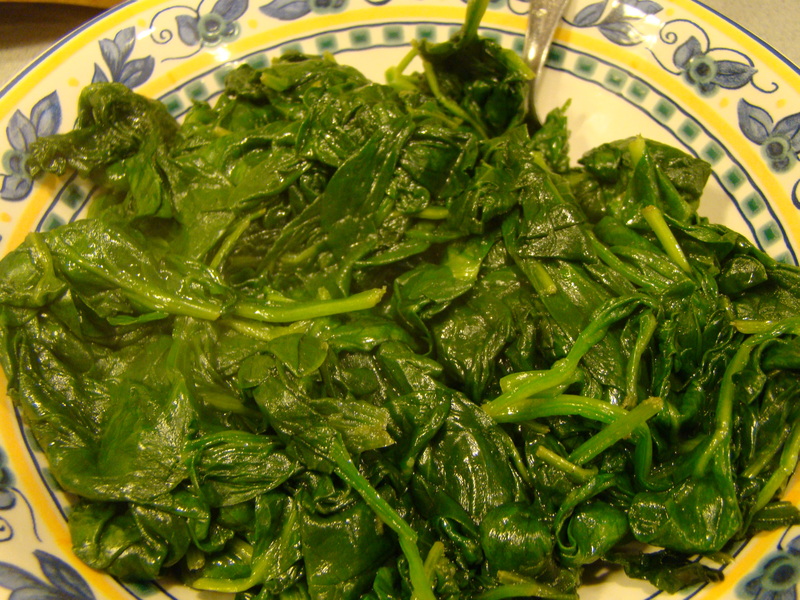 I love this spinach – you’re right, it’s done when it’s done! I love the idea of serving it with scallops! Sounds (and looks!) like a wonderful meal! the sun-dried tomato. Have a happy Easter. Spinach does shrink down a lot. This was a simple and easy dish to prepare. Have a Happy Easter. I’m sorry to hear that it was such a disappointing month. I think April looks promising, though. 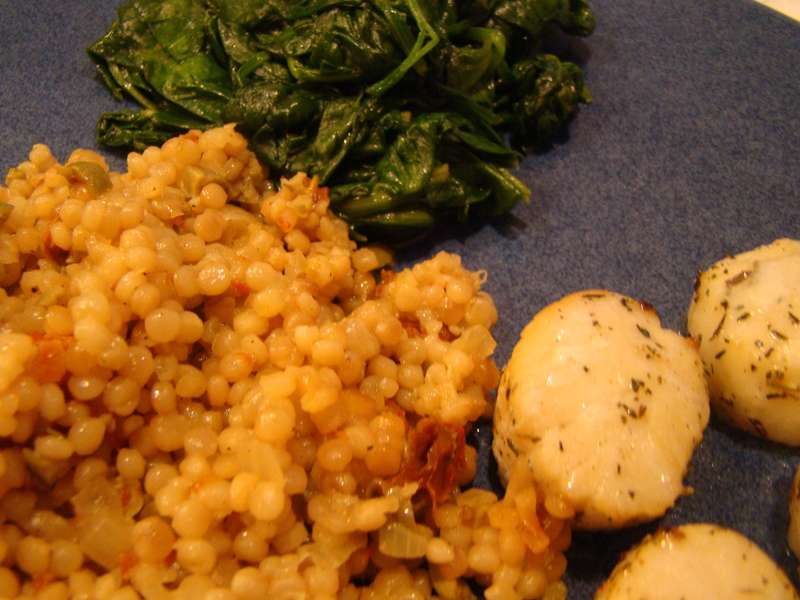 It’s hard to go wrong with lemon and spinach, so I expect this dish will have been a hit for most of us. 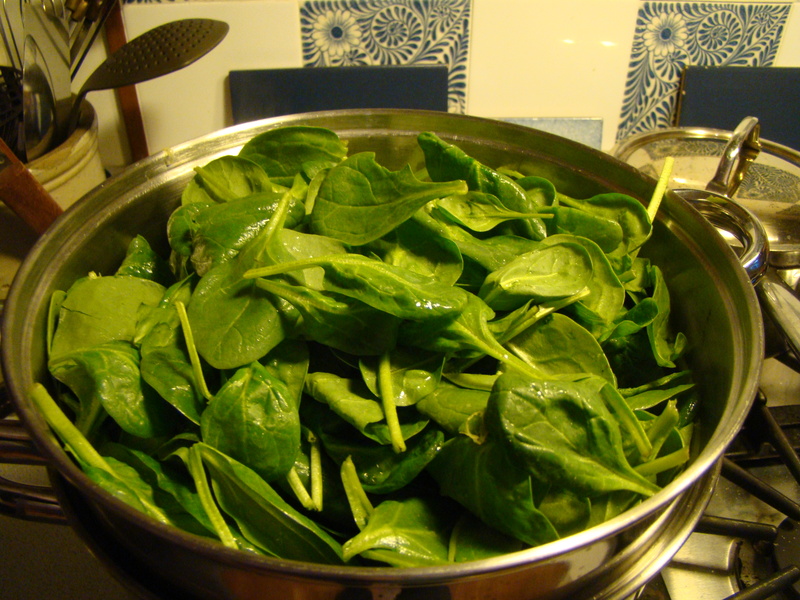 It tickles me that a bunch of spinach can make a very large salad or a very small side dish, depending on preparation. I think that there are some recipes that no one has voted for and eventually we must cook them all. I am already uncertain about olives and sugar in the same batter. Done when its done is good! April looks promising so lets keep our fingers crossed. Happy Easter to you and yours Betsy! Your entire meal looks great! I am glad you liked this recipe better than some others this month. I love your hand shaped salad servers. Hope you had a Happy Easter! March is my least favorite month of the year and I think that sometimes colors my opinion of the recipes. I looked back and noticed that I didn’t really love the 2012 line-up either. I too am looking forward to April and, if it’s not too much to ask, a little warm weather.